Customers will receive up to 50% off on five best-selling items while supplies last: Gardein Seven Grain Crispy Tenders 9 oz. $3.39 (Reg. $6.79), Dr. Bronner’s Liquid Soap Peppermint or Lavender 32 oz. $8.29 (Reg. $17.99), C2O Coconut Water 17.5 oz. $1.39 (Reg. $2.69), Bragg’s Apple Cider Vinegar 32 oz. $4.99 (Reg. $8.99, and Health-Ade Kombucha Ginger Lemon 64 oz. $9.99 (Reg. $19.99). Customers will also enjoy great savings on almost 100 Super Saver Deals! There will be additional storewide savings all day including 10% off purchases of $50 or more, 20% off $100 or more, and 30% off the hot table and salad bar. The Deli closes one hour before store closing. The event features a Summer Market from 10:00 am to 2:00 pm. There will be live entertainment, local vendor pop-up shops, free sampling, and free kids’ activities including face painting and balloon art. The company began in 1977, in Wailuku, Maui, when a group of friends started the first Down to Earth store, and shortly afterwards opened the King Street store. They did so to make available to Hawaii’s residents organic and natural products at affordable prices and to educate about the many benefits of living a vegetarian lifestyle. Mark Fergusson, who has been the CEO/CFO of Down to Earth for over 25 years said, “Over the past forty years, Down to Earth has grown and flourished to become an important part of Hawaii's community with five locations on Oahu: Honolulu, Kailua, Pearlridge, Kapolei, and Kakaako on Oahu; and Kahului on Maui. 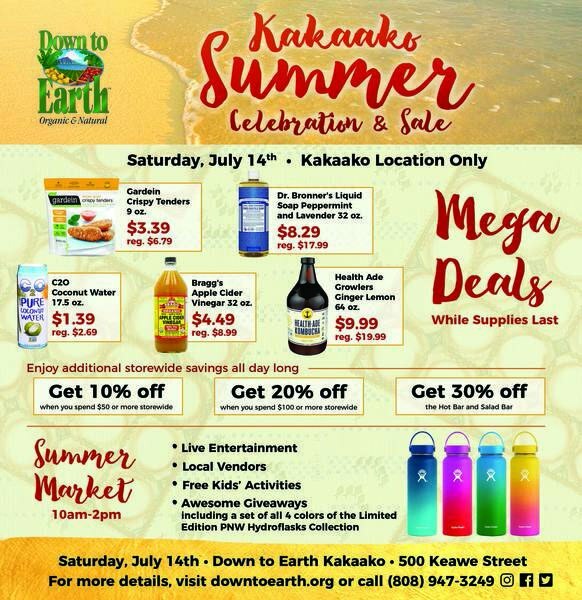 The Kakaako store sets off a period of growth for Down to Earth. At the end of this year, Down to Earth will relocate its 4,000 square foot Pearlridge location to a new, stand-alone 10,000 square foot building in the same Pearlridge Shopping Center. In spring 2019, it will relocate the 6,000 square foot Kailua location a few blocks away to a 15,800 square foot space in the former Macy’s building in the center of town. 2018 is the 12th year in a row that Down to Earth has won the Star-Advertiser’s People’s Choice Award for Best Health Food Store. Click here for directions to the Kakaako store. Free 1 Hour Parking with Validation in the Keauhou Public Parking garage which is part of the Keauhou Lane apartment complex. You can enter the Keauhou Public Parking garage via Pohukaina (in between Keawe Street and South Street) or you can enter through South Street (in between Keawe Street and Halekauwila Street).